The structure of a growth or an etch front on a surface is not only a subject of great interest from the practical point of view but also is of fundamental scientific interest. Very often surfaces are created under non-equilibrium conditions such that the morphology is not always smooth. 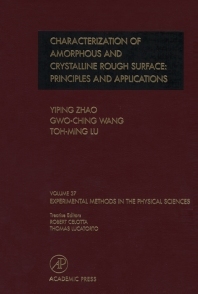 In addition to a detailed description of the characteristics of random rough surfaces, Experimental Methods in the Physical Sciences, Volume 37, Characterization of Amorphous and Crystalline Rough Surface-Principles and Applications will focus on the basic principles of real and diffraction techniques for quantitative characterization of the rough surfaces. The book thus includes the latest development on the characterization and measurements of a wide variety of rough surfaces. The complementary nature of the real space and diffraction techniques is fully displayed.